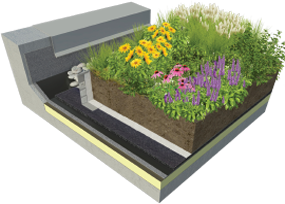 Our product line includes high performing base layers, different types of engineered growing media and a variety of Canadian pre-grown mats. 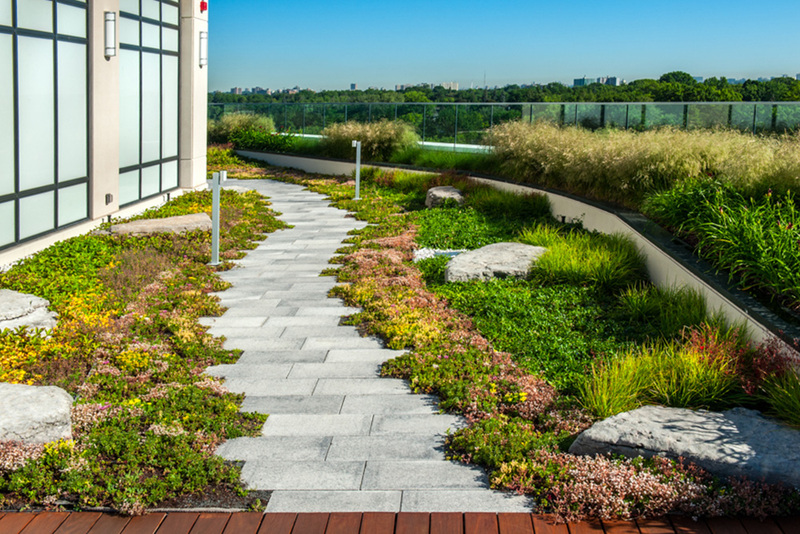 Different systems offer various levels of benefit including stormwater management, biodiversity, energy efficiency, extending life of roof membrane and aesthetics. Excellent water-retention-to-weight ratio. Lightweight and perfect for retrofits. Water retention ranges from 29-62 l/m2 depending on chosen system. Plants are grown on a “mat” and harvested like sod. Easy to install and excellent cover. Retractable, if necessary, for easy roof access. 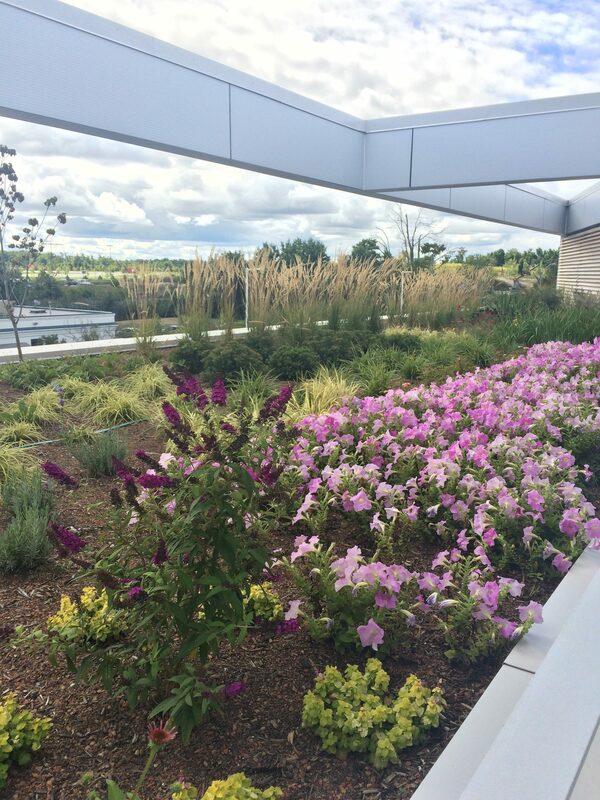 Plants may include a variety of sedum, mosses, allium, delosperma, herbs, wildflowers and grasses. Pre-grown sedum mats have 8 to 10 species of sedum and a variety of mosses. Contact us for plant list. Premium, high performing base layers. 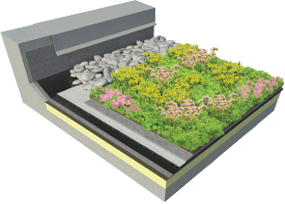 Loose-laid system consists of a mix of pre-grown sedum and drought resistant meadow plants rolled out on top of 15 cm of semi-intensive engineered growing medium. Alpine meadow plants are grown on a “blanket” and harvested like sod. Come in rolls, easy to transport and install. Provides instant green with 85% foliar coverage upon installation. Helps reduce water evaporation, soil erosion and weed growth. 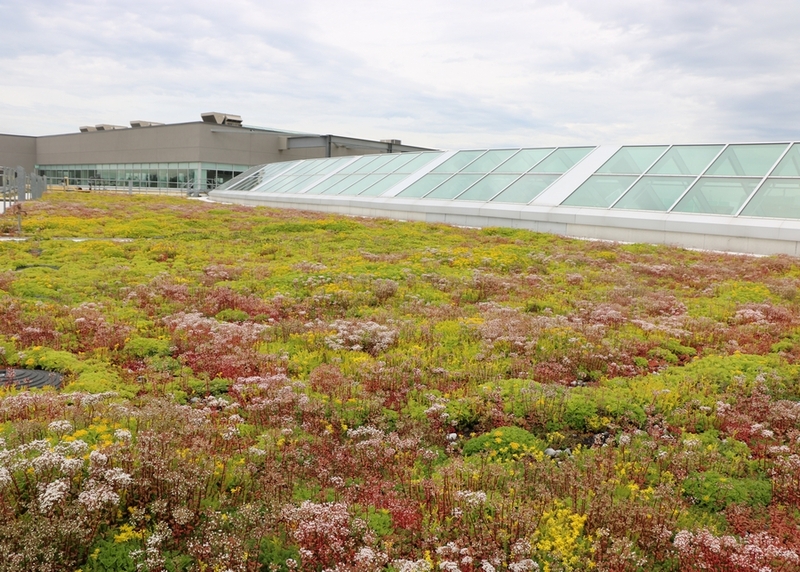 Design options include undulating roofscapes. Growing medium depth can be customized and increased where building allows. 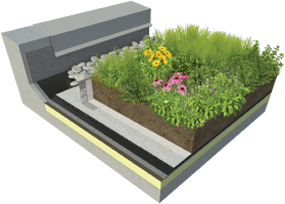 Stormwater retention can be increased with Needled Mineral Hydro Blanket or recycled polymeric water retention layers that can hold up to 60 percent of rainfall compared to traditional growing medium of the same thickness while remaining lighter. Frequency of maintenance, irrigation and management is generally more often than extensive, and less than intensive. Great potential for design and biodiversity from home gardens to public parks, for play or quiet relaxation. Native and non-native grasses, sedges, shrubs, perennials, aromatic herbs, berries, vegetables planted in 20 cm or more of intensive engineered growing medium. Growing medium is a proprietary blend of mineral and organic components. Depth can be increased and customized as needed. Routine maintenance, irrigation and management required.